The plunge into cloth diapering, that is. No, not the old-school kind my mum used to use (gosh, I still remember swishing these out in the toilet - so gross). Instead - the new and improved, one-size all-in-one (that's a nod to you, dear - the easier, the better) fancy-shmancy baby pants. It's not so much an environmetal thing (though it's a nice perk). It's more of an economical thing. 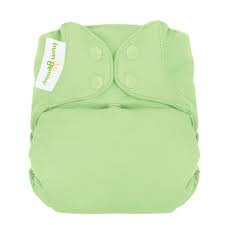 For the cost of about a 2-month supply of disposable diapers, we can have cloth diapers fit for 2+ years. Seems a hard deal to pass up. And yes, I know it'll be more laundry - but there's always laundry to be done anyway, right? I think I can handle it. But either way - we're about to find out real soon-like. Oh my goodness, I remember swishing out diapers too! Yum! Love you Rae rae!